We love a seafood platter in the summertime — especially one that features fresh, local fish. Here, we imagined what a modern twist on this classic dish might look like. Fluffy on the inside, crispy on the outside, this is the best crab hush puppy you’ve never had — no frying necessary. the size of your waffle iron. 1. In a medium bowl, mix dry ingredients. In another bowl, stir together remaining ingredients except crab. Combine wet and dry ingredients and stir to blend. Gently fold in crab. Let mixture sit for 10 minutes while the waffle iron heats. 2. Preheat waffle iron on highest setting. Once heated, grease the iron with cooking spray to prevent sticking. Spoon mixture onto hot iron, spreading into a thin layer with the back of a spoon. Close iron and check at 5 minutes. Cooking times will vary depending on waffle irons. For softer, cake-like waffles, remove and keep warm in oven when lightly browned (about 5 minutes). For crispier waffles, spread batter thinner and cook longer, until a dark chestnut brown (about 10 minutes). Note: When making for a crowd, preheat oven and baking pan to 250º. As waffles are done, place on baking pan in warm oven. 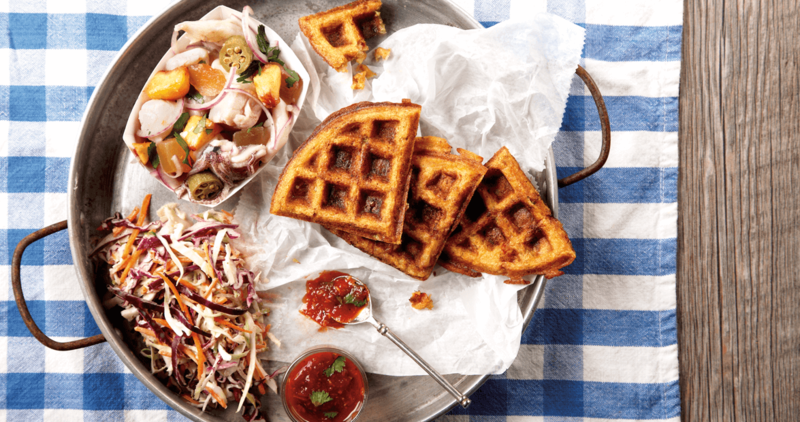 Waffles can be made ahead of time, frozen, and heated in the oven or toaster oven. North Carolina flavors — peaches, pickles, and local seafood — get the South American treatment in this Southern twist on ceviche. Yield: 6-8 platter servings or 12-16 appetizer servings. 1. In a nonreactive (glass or stainless steel)bowl, combine lime juice, pineapple juice, pickle juice, honey, salt, pepper, and pickling spices to create a brine. 2. Put fish and seafood into large nonreactive bowl. Pour brine over seafood. Cover and refrigerate for 8-12 hours, until the seafood is firm and opaque. The brine will “cook” the seafood, but if preferred, blanch before adding the brine. 3. About 2 hours before serving, stir in pickles, vegetables, fruit, and parsley. Serve chilled and keep cool. Note: Always use fresh, clean seafood. Choose fish that’s mild and not too strong-tasting.